Heacham lies on the north-west coast of Norfolk - fourteen miles north-east of King's Lynn. The town sign depicts the Indian princess Pocahontas who married John Rolfe (1585-1622). The Rolfes had been lords of the manor at Heacham for centuries. The story of Pocahontas has been the subject of many novels, children's books and more recently a Disney animated film. John Rolfe travelled to America with his wife on board the Sea Adventure - but when they arrived in Virginia his wife fell ill and died. 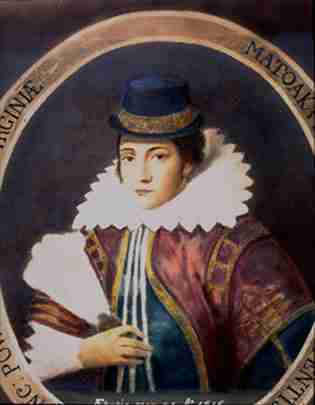 Rolfe then married Pocahontas - the daughter of Powhatan - the most important Indian chief in Virginia. Pocahontas had previously saved the life of Captain John Smith in 1607 by throwing herself between him and Powhatan's braves. In 1616, Rolfe, Pocahontas and their child returned to England - where she became a celebrity and was presented at court. She also converted to Christianity and changed her name to Rebecca. However, the English climate did not agree with her and she died in March 1617. Rolfe remarried again and returned to Virginia where he died. Inside St Mary's Church there is an alabaster memorial to Pocahontas which was erected in 1933.